Welcome to Our Community | Massachusetts D.A.D.S. Our mission is simple... to assist and support, through fellowship and action, the fathers and families of individuals with Down Syndrome. 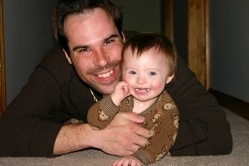 Please take a moment to register for an account so that we can stay in touch with you about upcoming events and news..
Dads Appreciating Down Syndrome, or D.A.D.S., is an organization of fathers of children who have Down syndrome. We hesitate to call ourself a “support group,” even though we do, in many ways, support each other. We prefer to think of D.A.D.S. as an “action group.” You won’t find us in a church basement drinking warm coffee and whining about having children with Down syndrome. Instead, you’ll find us out in the community coaching our kid's sports teams, participating in our children’s IEPs, volunteering at local Down syndrome fund raising events, and even sponsoring fund raising events of our own.